On a Windows Tablet (or a Tablet PC) MessagEase provides unsurpassed performance and unparalleled access to all letters and characters. 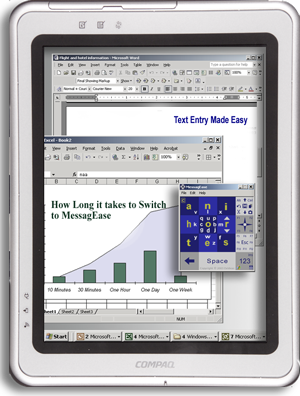 Using a relatively small area of your tablet, MessagEase empowers you with the functionality of a full keyboard letting you interact with any Windows application. MessagEase Onscreen Keyboard, as this version of MessagEase is called, includes support for all function keys (F1-F12) and all Ctrl and Alt key combinations. Additionally, you can shape this keyboard to be a square, wide or long rectangle to suit your need and taste. You can also make the keyboard semitransparent to see the area behind the keyboard. MessagEase for Windows is adaptable to any language and alphabet. In addition to English, you can configure the keyboard for Spanish, German, Arabic, Hebrew, Persian, and Japanese Katakana. You can also create your own language keyboard (if you are technically minded, all the instructions for doing so are here. Forget handwriting commands! Use MessagEase to use the keyboard commands you are familiar with any application! Download and try MessagEase for windows and see for yourself how easy you can work with your Windows Tablet.